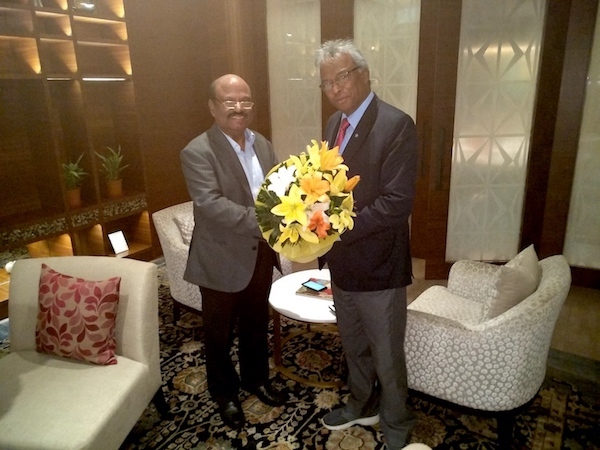 A few days later, Prof. Parsuramen met with the Speaker, Dr. C.V. Ananda Bose, in New Delhi. Prof. Armoogum Parsuramen (Center), the new President of GEP Mauritius, with Sri Kadakampally Surendran, the Kerala State Minister of Tourism (Left), His Excellency Kummanam Rajasekharan, the Governor of Mizoram (2nd Left), Dr. M.R. Thampan, GEP Secretary, and His Holiness Jagadguru Swami Isa, Founder of GEP (Right).